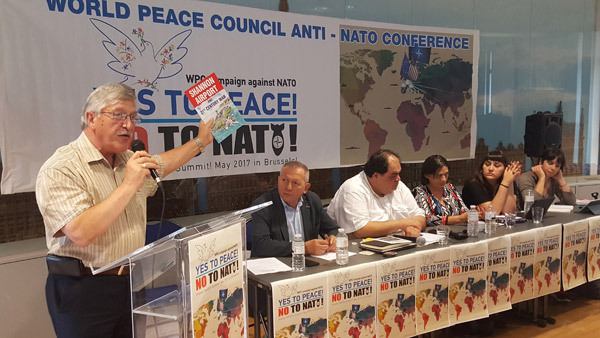 A large PANA delegation attended the WPC and No to NATO -N0 to War conferences in Brussels to ensure its delegates were aware that the six counties of Northern Ireland as part of the UK, were and remain part of NATO since its foundation. The other key issue was to highlight the reality that the Republic of Ireland is not a neutral state, but a de facto US Aircraft carrier, with well over 2.5 million US landing in Shannon Airport in order to help it and its allies such as the UK, to destroy, Afghanistan, Iraq, Libya, Syria and the Yemen. After the horrific attack in Manchester, a city with very strong Irish connections, by terrorists supported by the UK when they destroyed Libya with a four month bombing campaign and supplied the terrorists with military and financial support, we wish to make it clear that PANA was the only peace movement in Ireland that did not support the “freedom fighters”. Every effort we made to condemn Libya’s destruction was ignored by RTE and rest of the Irish corporate media. The photograph above shows the Chair of PANA. Roger Cole holding up the PANA/Shannonwatch document ‘Shannon Airport & 21st Century War’ which was widely distributed at both conferences. It can be downloaded from this site, or a copy is available by contacting PANA on: 00 3531 (0) 2351512. The President and Vice-Presidents are prominent individuals who have agreed to support our objectives.